Wasim Khan has a unique perspective on the state of cricket in England. A member of Warwickshire's 1995 championship-winning team, he has become one of the game's most influential figures, thanks to his work with the Chance to Shine charity, set up a decade ago to tackle a crisis in cricket participation in state schools. The Birmingham-born batsman, whose family originate from the Kashmir region of Pakistan, was awarded an MBE in 2013 for services to cricket and the community, while his autobiography,Brim Full of Passion, was voted Wisden's Book of the Year in 2007. 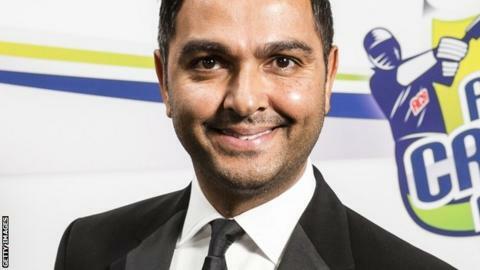 Now the 43-year-old is about to take on the role of chief executive of county side Leicestershire, and he spoke to BBC Sport's Joe Wilson about the challenges that cricket will face in the months and years ahead. When the Chance to Shine project began, it was estimated that cricket was played in fewer than 10% of state schools. Is cricket still seen as elitist? Wasim Khan: "It depends who you ask. If you spoke to the 11,000 state schools and the 2.5 million children that we've taken cricket to, they would probably say 'no'. "If you spoke to people who viewed cricket purely in a way which asks where the next England cricketer is coming from, how many state schools are producing professional cricketers etc, then they would probably have a view that it is elitist. "Unless the Chance to Shine charity is supported for years and years to come, potentially we could lose hundreds of thousands of children we're not currently able to reach." The ECB's exclusive deal with Sky has recently been extended to 2019. Should some England cricket be on free-to-air television? "I think in an ideal world it would be fantastic to have one or two Test matches during the summer holidays so children can actually watch their heroes on terrestrial TV, but the nature of these deals, I suspect, is that it is all or nothing. "Somewhere along the line, there is a need for a compromise, because kids are losing out. In the future, the ECB should seriously consider what could be gained by some element of cricket being on terrestrial TV." Is the current 18-county system sustainable and does T20 need a higher profile in this country? "I believe that each of the 18 counties has a huge role to play. Getting children, getting communities involved is critical. "The ECB supports us a hell of a lot, but there's always more that we feel could be done. Where can less be spent by the ECB to ensure more can happen across counties and local communities? "Is there an opportunity to move the early two Test matches, currently scheduled for May, to the back end of the summer and move the main Test matches forward? "That could create a window of time where you may have two or three weeks of condensed T20 cricket in mid-August. And that would enable us to hit the families and the children, so we can actually deliver to the markets we are trying to reach. "At the moment, it's a bit hit and miss - and the figures show that." Does cricket have a role to play in fostering social change in communities like the one you grew up in Birmingham? "There is always a fine line between integration and supporting what communities want. Many of them may want their own leagues and to play with families, friends, uncles, but how is that supporting integration? "If sport can be used for a force for good, then are we using a common passion amongst Pakistani Muslims, in particular, to really find a way of helping them to integrate into mainstream society? I can sit here as a Pakistani Muslim and say it's still not happening. "I think there will be more pressure on sports like cricket to show that they are about more than just finding the next best players. "Cricket will increasingly come under pressure to provide evidence that it's supporting the National Health Service by delivering on objectives around keeping people active, that it's dealing with conflict resolution by uniting communities."